In a large non-stick skillet, heat the olive oil and sauté the onion slices, until starting to soften. Stir in the curry paste and cook for about 30 seconds. 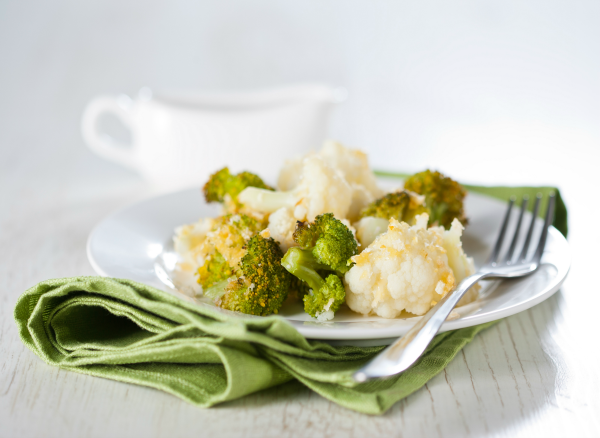 Then add the broccoli and cauliflower florets and stir-fry for a few minutes. Pour in the coconut milk, soy sauce and add the sugar and a sprinkle of salt. Stir well and bring to a boil. Quickly reduce the heat and allow to simmer for about 3 minutes or until all the vegetables are tender, but not soft. Remove from the heat. Stir in the nuts and cilantro. Stir well and enjoy immediately.